Breitling Navitimer Caliber 23 Quickset Date? I got an email once asking me if the Breitling Caliber 23 had a quickset date, and I replied that it did not. And, it doesn’t, which is odd, since the previous Caliber 13 has one. The Caliber 23 is used in the current standard Navitimer with the 3,6,9 subdial layout. I got to thinking, about how some of the older non-quickset Navi’s had the ability to let you change the date by turning the hour hand back and forth over the 12 midnight marker and how you could advance the date much more quickly that way, and I wondered if I could do that with my Navitimer. I didn’t want to mess with the date since I would have to move it all the way around to get it back to normal so I tried to look it up online, and found that there were others with this question as well and no answers. Well I have the answer, and the short answer is yes, kinda. The date can be quick advanced by moving the hour hand to about 8:30pm on mine, then back over 12am.. and the date changes. That is quicker than advancing it all 24 hours. Your watch may not need to go all the way back to 8:30, but mine is about that. Breitling Montbrillant Legende – Press Pics available! Breitling has finally provided press photos for the new Montbrillant Legende. This model is set to replace the current Navitimer Heritage model which is smaller at 43mm. The Montbrillant Legende will be an imposing 47mm, with an integrated bracelet. This model might have to make it’s way into my collection, as I was eyeing the Heritage before, and also the world. I love the 2 subdial layout with the 6 o’clock date window. Powered by the Breitling Caliber 23 movement, the same one that is in the standard Navitimer model, this model will sure to be a hit! Available in a variety of case combinations, with 3 dial colors: Silver, Black and Bronze. Silver will be on my wishlist. 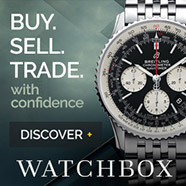 I’ve looked around at a few places to buy Breitlings online, and between some of the bigger sellers such as Jomashop, authentic watches and world of watches… World of Watches definately seems to have the edge in price. Their selection is somewhat limited however.. with only just over 30 in stock. Their watches are guaranteed authentic with several of the more popular models such as the Chronomat Evolution and Bentley models for up to and sometimes over 30% off the retail price and no sales tax outside of the state. This watch has been hyped up a lot, using a new Manufacture movement, the ML 128 from Maurice Lacroix. This groundbreaking new movement only has 2 hands and a disc to indicate the hours. Full product shots have not been disclosed as ML slowly is releasing animated shorts and product glimpses up to the unveiling at Baselworld 2008. This new movement has a 3/4 rotor, and will memorize the time and chrono locations with the hands as the user switches between chronograph and time mode. This is surely one of the most complex complications ever devised! Received an email today from a visiter referring to a American Express Breitling watch, apparently exclusive to the company. I am not aware of such a watch… wondering if any of you are? I do particularly find it rewarding when users email me with praise about my website, as I did spend a lot of time developing it and the backend for it as a serving system for Breitling watch information and building the forum up from nothing. The Amex Breitling that this guy talks about is interesting to me since Breitling does not make exclusive watches anymore, and you pay a lot of money to have your logo put onto the watch face as mentioned in a prior article. Was just looking at your wonderful website and thought you may be able to help me. Back in about 1982/83 I purchased a Breitling watch from American Express. They used to have catalogues of some very nice unusual items, and as I was living in a very remote and rugged part of Australia I ordered the Breitling watch. It was satin black and had quite a small face, almost like a ladies watch. It had a simple face in black also and was waterproof to some ridiculous depth. The band was a matching black metal band and for its size it was quite a heavy timepiece. It was a very durable watch and took all kinds of beatings in its stride. I had a jeweller replace the battery and he broke the winder mechanism simply because he didnt know what a Breitling watch was or how they were constructed. He failed to unscrew the winder first to break the seal so he forced it with a tool. The watch was ruined and has since been lost. I would like to know if you are familiar with this timepiece? I have never seen another one in all my travels and would like to know what it was as I can seem to find one on the net either. Apparently they were exclusive to AMEX.